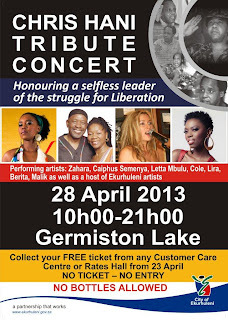 GoXtra News: FREE TICKETS: South Africa's TOP Artists To Honour Chris Hani At a Tribute Concert! FREE TICKETS: South Africa's TOP Artists To Honour Chris Hani At a Tribute Concert! The City of Ekurhuleni is continuing to commemorate the life and legacy of Chris Hani, this time through music at the Chris Hani Tribute Concert to be held at the Germiston Lake on April 28. 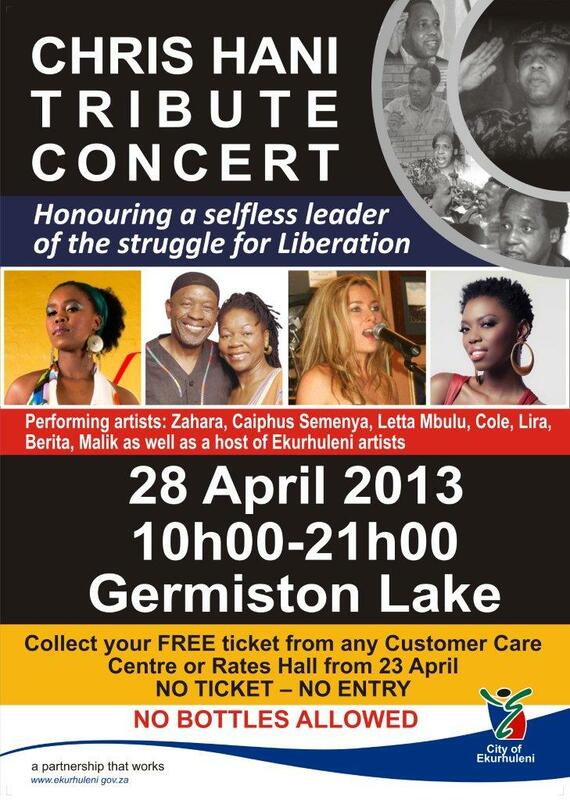 Artists Lira, Zahara, Caiphus Semenya, Letta Mbulu, Malik and Berita will honour the selfless leader of the struggle for liberation, whose final resting place is at the Thomas Nkobi Memorial Park in Germiston. Local performers Tshidi, the Taiwa Jazz Band, Black Mok, Cole Van Dias, the Music Academy of Gauteng and more will also entertain crowds on the day. Entrance to the concert will be free, however, only people with tickets will be allowed entry into the venue. Tickets will be available from all of the City’s 20 Customer Care Centers from next Tuesday, April 23. The City has just finished a R12 million upgrade of the Germiston Lake and the concert is to be one of the first major events to be hosted at the facility. Families are welcome to enjoy the park which features three play areas; new park furniture, braai and picnic facilities including gazebos; a fully equipped open-air gym and revamped pathways for walking and jogging. There is a junior playground furnished with modern play equipment. Old playground equipment has been revamped and placed in the senior kids’ playground. The skate park has been fenced off and restored. There is also a play area tailor-made to accommodate people living with disabilities. Gates open at 10:00 and the performances will end at 21:00. No bottles or weapons will be allowed into the venue.